A fire engine from Fire Station 102 was involved in a series of accidents last Wednesday night in North Hollywood. At about 2:30 a.m., the fire truck was on its way to respond to a medical emergency. The fire engine had its emergency lights and sirens turned on. The driver suffered an unidentified medical emergency when the fire engine was in the 13700 block of Burbank Boulevard near the Woodman Avenue intersection and lost control of the fire engine. The truck subsequently crashed into multiple parked vehicles. It also took down some power lines, which sparked a fire in a liquor store nearby. According to Los Angeles police sergeant Randy Modrell of Valley Traffic, the fire department will be conducting an internal investigation of the accident. Local police will be coordinating the accident investigation. There was no discussion of possible charges being filed against the fire engine driver. At least six parked cars sustained damage in the accident. After the liquor store fire was reported, the fire department dispatched dozens of firefighters to the crash site. 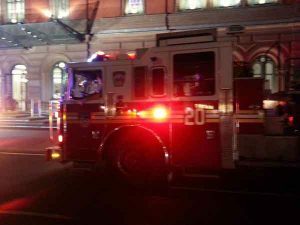 The fire was reported to be under control by 2:47 a.m. However, the Los Angeles Department of Water and Power had to dispatch a crew to deal with the live wires at the scene. Updates regarding the injured firefighter’s condition have not yet been released. He was previously reported to be in serious condition. A spokesperson for the fire department confirmed that the man was the only firefighter reported to be injured. In the aftermath of a car crash, victims are usually eligible to file an insurance claim or sometimes even a personal injury lawsuit against the responsible driver to recover compensation for their medical expenses, property damage, pain and suffering, and other losses. But what happens when the crash was caused by a civil servant in a government vehicle? Although these cases can certainly be more complex, victims can still seek compensatory damages. Fire truck accident victims – or their surviving family members in the case of a wrongful death claim – can consult a personal injury attorney to discuss their legal rights and options. These can vary from state to state. In California, public employees such as firefighters are generally not held liable for civil damages such as injuries and death, provided the accident occurred at the time that the civil servant was acting within the scope of employment. In other words, victims cannot generally sue firefighters, but they may sue the entity that employs the firefighters. It’s important to note that although civil servants are generally immune from liability in these specific cases, they are still expected to drive with reasonable caution to public safety. The Los Angeles truck accident lawyers at Ellis Law have been serving as effective legal advocates for crash victims for more than 20 years. If you or a loved one has been the victim of a crash – whether caused by an emergency transport vehicle or private vehicle – you’re invited to schedule a complimentary, no-obligation case review with our personal injury team. Call us at 310-641-3335 and let us know how we can help you.